You can donate your social influence via Klout for Good in a few ways. Sharing information through your social networks (Twitter and Facebook) is certainly the easiest and quickest way to help. However, you can also find opportunities to donate time and money when you visit the charity website. In December 2012, Klout partnered with Operation: Social Santa to collect and distribute toys for underprivileged children. Through this program, influencers had the opportunity to create awareness, donate toys, and even head up collection teams in their city. How much or how little you give is up to you, and every little bit counts. Your influence matters! It isn’t the quantity of followers you have on your social networks, but the quality of interactions that really makes a difference. When you leverage your influence to provide valuable information about ways your followers can give back or learn about what’s important to you, you contribute a rich and valuable social dialog. And if you can help someone in the process, that’s even better! Make sure you are logged in to Klout.com by signing in with your Twitter or Facebook account in the upper-right corner of Klout.com. Visit klout.com/s/forgood and locate the campaign you wish to share. Select the campaign by clicking the photo. Click the Twitter social share button. A pop-up box appears with a pre-written message included. Edit the text of your tweet here or leave it as is. When you have the message you want to share, click Tweet. Your tweet now appears in your Twitter feed. 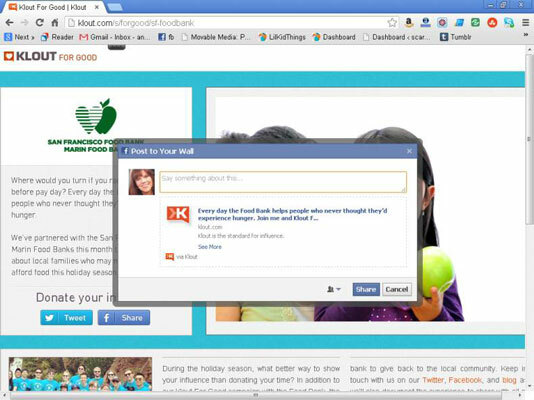 You can also share social good programs from Klout via your Facebook Timeline. Klout makes it easy to share with the embedded social share button. 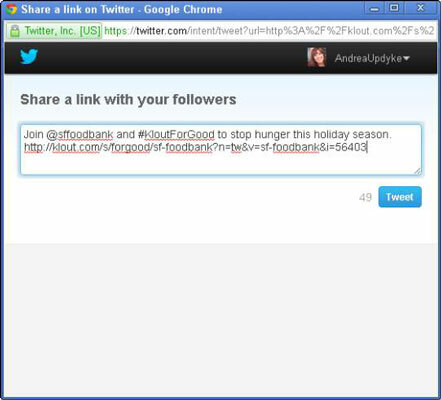 Point your browser to klout.com/s/forgood and scroll down the page until you see the campaign you want to share. Share with your Facebook friends or fans by clicking the Facebook social share button. To create your post, add a message in the text box or simply post the link. Complete your post by clicking the blue Share button. Your Facebook post is shared to your Facebook Timeline and appears in your friends’ News Feeds. You don’t have to be limited by the social share buttons on Klout! To share a Klout for Good campaign on other social networks not represented by the social share buttons, simply copy the link associated with the campaign you wish to promote and paste it into the status box in whatever social network you prefer. Feel free to add your own message along with the link.